Welcome to any of the folks I met with while in central Missouri! I had a grand time and am thankful for your hospitality and the welcome you showed me. I had 5 different events while I was down there. Three pro-life presentations, an ‘apologetics’ presentation, and then a retreat (apologetics). I have some video from these that I’ll work on and try to get online. As of this particular moment, my next series of events are in mid October and I’ll be taking five days or so to travel across Michigan. Details to come. Anthony Horvath is an author and speaker. He is married and the father of four. 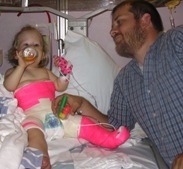 He is the stay-at-home caretaker for his daughter, 'Renny', who was born with spina bifida (myelomeningocele). He is available to speak and present on pro-life issues, as well as his other books and ministry activities. He is a member of the Lutherans for Life speaker's bureau and former president of Wisconsin Lutherans for Life. He is also the founder of the Policy Intersections Research Center. © 2019 We Chose Life: You Should Too.